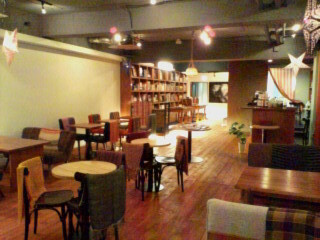 The first café I’d like to introduce is a relatively new one: The World Books & Café. Located on the 5th floor of the Ohsawa Building (South 1 West 1), the World Café is, in some ways, still a work in progress. From its name, you would expect a bookish atmosphere, but World Café goes well beyond the expected, offering a huge collection of books – mostly travel themed. The only drawback (though understandable), is that you can’t take them to your table to look at over a cup of coffee. 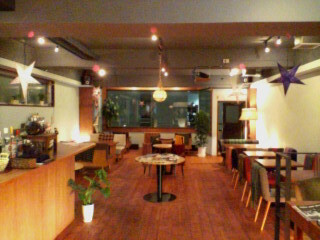 The staff is very friendly and service is what you would expect from a city café. The first night I visited I had risotto and seafood pasta with a basil sauce, and the staff at the bar made a Cinzano rosso and dry ginger ale just as I asked, though it wasn’t on the menu. To my thinking, the food was just a little salty, but otherwise it was tasty and there was plenty of it. A final thing in its favor is space! Unlike many other coffee shops in which you almost sit on your neighbor’s lap, Word Café offers plenty of room and a nice choice of table size. So if you’re looking for a quiet place to spend an hour, give The World Books and Café a try…you might even see me there!